Hello everyone we are happy to present to you the blog of the week and a Nigerian blog with great article this blog is basically ment for last tech update and many more. What type of technology related issues can I get from this blog? 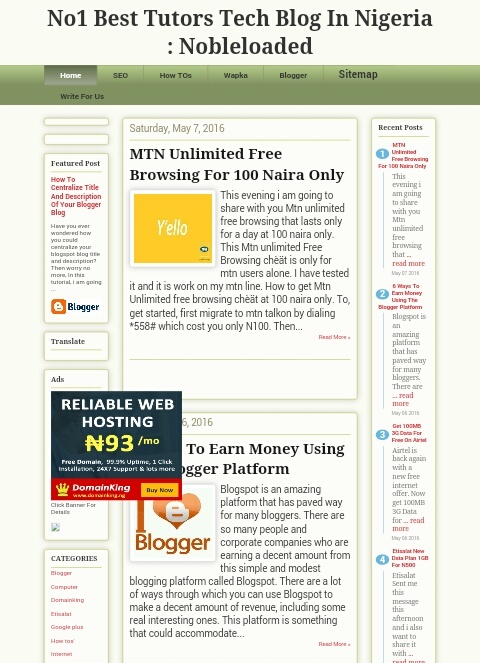 Nobleloaded Blog is a blog were you can get the latest and trending cheat for glo, mtn, etisalat and other software terms and conditions including some tutorial on how to use any new gadget. 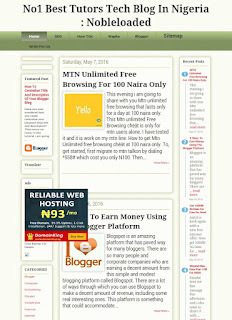 Hello Emmanuel Ekanem your blog is perfect and unique in content and try to put more effort in creating your audience and also don't focus on only Google Adsense and the sky will be your starting point congratulations once again. Hope they don't posts weekly? Huh! I can assure you that everyday not less than 6 post are being published so don't bother any blog that is been placed as blog of the week is been reviewed and approved. During the blog review many blog were perfect and suitable for this position but there must be a winner, don't forget next week might be yours so don't give up now. We would like to inform you out there who will like to be given a chance to be in this type of position as the best blog of week should always drop their blog or website link below for review thank you. Wow! Could not belive my blog will be here, Thanks Zealmat for the opportunity, thanks for giving that advice/encouragement to me, thanks, thanks and Thanks. Thanks Tarrmie, hope to see yours too. Thanks Mr Dinho, sure you can! Ikenna Uchegbu the design may be worst as you have said, but that does not draw me back, in life we are faced with the ups and the downs... And about the domainking banner, thanks for that. Wonderful Idea. I would like to be featured as one of the Blog of the week.